Download the amazing free video editor VideoPad Video Editor here. 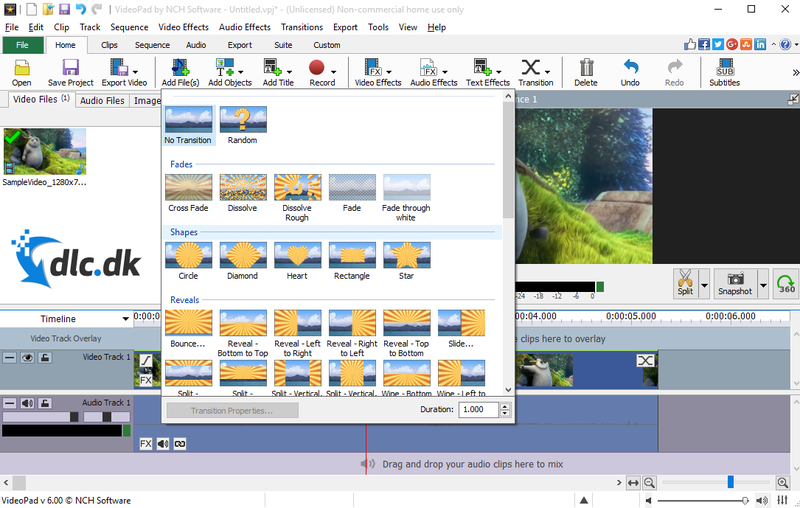 If you need a video editing program that contains all the main tools for working with audio and video editing, then the VideoPad Video Editor can be the program for you. The program is completely free to download and use, nor does it require the great expertise to use. You just drag your videos into the program, and you can throw in the many features and capabilities that VideoPad provides for you. 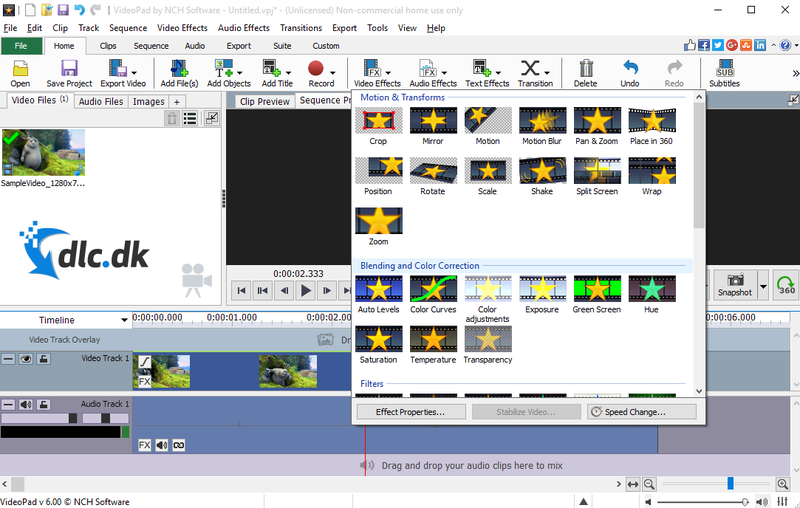 The program gives you a lot of tools that you can use to edit your video. During Transition you will find a lot of transitions that you can insert between the different clips, while under effects you will find a lot of possibilities to manipulate with your video. This can be done by changing the color of the video with one of the many filters, or as seen above, where a video is edited to zoom in on the video's main character. The possibilities are many and you get free rein to explore them. 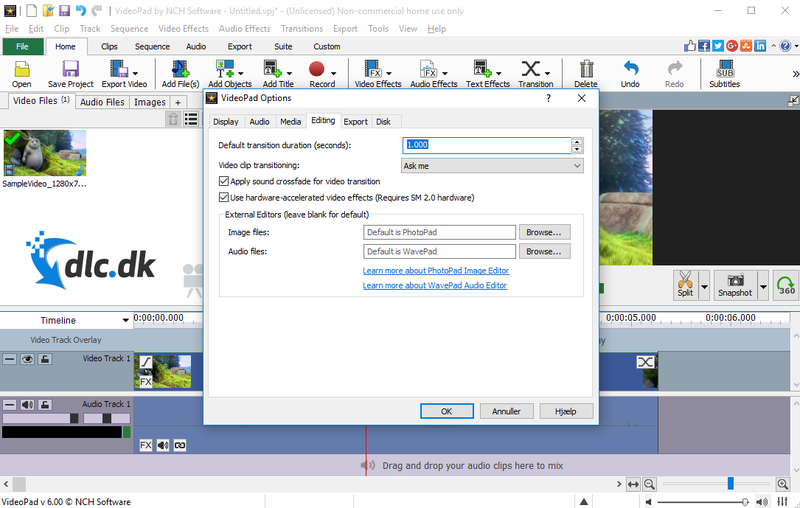 In addition to the classic tools mentioned above, with VideoPad you can also add subtitles. If you have a video or movie where the dialogue may be a bit low or incomprehensible, you can text it so that everyone can understand it. If the reason people can't be heard is that there is a lot of useless noise that overwhelms the people, this noise can also be reduced by the Noise Removal tool that you find under Audio Effects. It is of course important that a program that can integrate video formats from a lot of different directions can also handle as many formats as possible. Therefore, VideoPad Video Editor also supports all formats you may use while the program is also regularly updated to support any new formats. Therefore, don't worry about whether your new mobile, your new camera, or any third-party recorder in a format not supported by your editor. You can use all the popular formats like mp4, mov, vob, ogm, avi, mpeg, wmv, divx, xvid and many more. If you have finished making a video or movie that you want to give, for example, you can export your video to either a DVD or a Blu-ray. Both formats are supported while you can also specialize the export to support on portable devices such as mobiles, iPads and the like. Last but not least, there is also a 3D Video File menu where you can export your file in 3D so that it can be viewed in three-dimensional. However, this requires a longer explanation and is not as easy as it may sound. Therefore, you should seek help in the help videos mentioned earlier. The program's interface is incredibly simple to set up, allowing you to quickly and easily navigate the various menus. In addition, you are also helped further along the way, by the many help videos you can use in the program if you wish. You can click on these at any time to gain insight into how to use the many features of the program. With the help videos you can see, among other things, how to add videos to the program, as well as how to add text, effects, transitions and much more to your video. Unfortunately, the program is only available in English so far. You cannot therefore get it in Danish, and you may therefore need to get a dictionary if you encounter difficult technical words or the like. -weight: 400; "> Of course, the VideoPad Video Editor is not the only video editing program on the market and you can therefore take a good look at some of the competitors, including downloading the popular Windows Movie Maker that has been popular Since its release, another popular program is After Effects from the heavyweight Adobe, which is part of the absolute elite of editing programs, and may be for you, but after Effects costs money opposite the VideoPad, and you are only looking for Free video editing programs may be the VSDC Free Video Editor that you need to try. VideoPad Video Editor is currently only supported by Windows operating systems. Therefore, you cannot use the program with Mac OS. If you are a Mac user and are looking for a free video editing program, you may want to take a look at Movavi Video Editor . 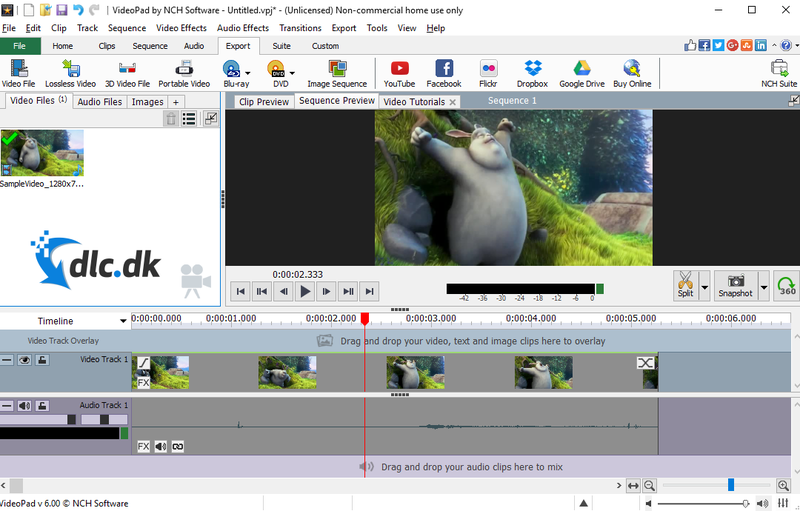 VideoPad Video Editor is a great tool for those who want to edit videos and movies. The program is completely free, which is a huge plus when it comes to this type of program. It includes all of the popular effects, transitions, and features you can expect in such programs, while also supporting all file formats you might encounter. In particular, the program's help videos are one of the benefits of this program. They guide you through the many different menus and options. The only minus that can be found in this program is that it is not available in Danish. In addition, it is also not available with Mac OS, and Mac users must therefore search for Alternatives such as Movavi Video Editor linked to above. Find VideoPad Video Editor, mark it and choose "Uninstall"
Should VideoPad Video Editor has been damaged or corrupted and thereby difficult to remove we can recommend you finding help to uninstall it here.